"A Week Shakespeare Would Like But Then Write Much Better"
After his incompetent reign last week in the BB House when he sent his own ally home and made an idiotic alliance which, of course, imploded, Fessy finally saw the light this week. Of course, at first he thought he was all that. He privately confided that his head of household last week was “brilliant” and he and Haleigh had a “strong new alliance” with Angela and Tyler. (Viewers at home at this point were either laughing or screaming at him that Angela would sooner have an alliance with a pot of gruel). They laughed uncomfortably. As did viewers. But self-deprecation is good for the soul. That elevated the show a bit this week, because it’s a show after all. And BB20, when it does things right, reminds us that while a half million dollar prize is on the line, it’s really just a high school lock-in of epic proportions. And silly things will happen. And people will make stupid mistakes. (And by people, we usually mean Fessy). Angela, the Queen of the Mean Girls on Level 6, seemed to embrace her role as evil Head of Household. But strangely, this didn’t make for the good television that we deserved. She moped and sat quietly for most of the week. And while she briefly (as in I’ll try to pretend to do this for the cameras) pondered keeping or honoring last week’s “deal” with Fessy and Haleigh, it soon became clear it was what we thought it was: a typical BB double-cross that everyone in the house saw coming except… Fessy. But she didn’t scheme or plan much or reveal really anything new about herself this week, and that is truly disappointing. Can she be a character we like? Can she become a great TV villain? Is there a redemptive quality about her? Sadly, we might not get to know because in a week where her power could have reigned supreme, she was mostly a non-factor. With the nominations of Fessy and Haleigh, the only questions to remain this week would be whether Fessy or Haleigh could win a veto and take themselves off the block, and which of the two showmancers would end up going home. Our angsty star-crossed lovers were doomed and knew it, but Haleigh did a better job of wanting to stay in the castle and play and made a few social connections with Level Six, although they really seemed to fear (for no real legitimate reason) Fessy’s physical gameplay. And speaking of shomwances, a second one is starting to form. Cold-hearted Angela and I-have-a-deal-with-everyone Tyler have become somewhat close this week (cue Faith Hill’s “This Kiss”) to the point where if they’re not a couple, they’re about as close as couple-like you can get with Angela. I’m pretty sure whomever wrote the copy for this is the same writer for Shakrnado (since none of it really makes sense), but it basically involved tennis ball-type machines shooting balls at contestants along with huge amounts of mud and slop and contestants having to try to catch the balls or squishy aliens (first with their hands, then later with their mouths) and putting them in a bucket. After the goopy, soppy mess, the Level 6 Women’s Football Player Kaycee defeated the World’s Worst Big Brother Player Fessy (because of course he’d lose) and sealed his fate of going home. And all of America celebrated. Finally. No more bad decisions. We finally… Finally…Finally got rid of Fessy. Even if we liked him (because he wasn’t a big meannie from Level 6) we understood he had to go to keep us free from terrible decision-making that makes TV viewers cringe. But alas, Julie informed us it was Jury Battle Back night. Fessy had yet another chance to earn his way back into the house. But this is BB20. Of course he wouldn’t do it. In a competition involving retrieving balls and throwing them down a tube (ever so difficult but it had to be quick since it was a live TV comp) Scottie won to return to the house and the rest is history. Shakespeare would have added a final twist to at least make us feel some genuine sorrow for Fessie. But even CBS can't figure out a way for that to happen. While an average week for BB, we finally saw Thursday some inner-plotting inside Level 6 that can potentially make the show interesting. The single biggest problem the season has been all of the players seemingly coasting, content to be in (for Level 6 and floater companions) a powerful voting block to the point that they haven’t dared wonder what happens when they actually have to turn on each other. Finally, this week we saw the origins of some future gameplay, with JC telling Tyler (not the one you want to tell it to, guy!) he would be targeting Angela and Kaycee, Brett deciding that Angela and Kaycee are also a threat and zeroing in on Tyler for a final two deal, and Scottie earning his way back into the game but before doing so telling Julie Chen he wants to work with… Tyler. Tyler has more deals than your local used car lot salesman, but we tend to see this backfire on BB. But this is the issue on BB—until there’s more scheming, when there’s a dominant alliance it’s never quite great fun to watch. Still, the addition of Scottie back into the house could make things interesting if Haleigh or Scottie chance to win the Head of Household in the coming week. If not, we may be doomed to another week of mediocrity. Battle-Back competitions always interesting and can change the game. Fessy was a good sport after discovering he’s been duped the whole time. Level Six players finally starting to think about what happens later in game. Dominant Alliance shows are never exciting until someone creates inner drama. Didn’t happen. Yet. 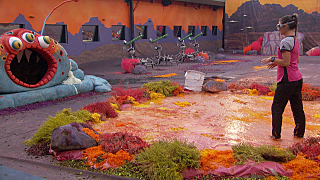 HOH, POV, and Battle Back competitions were bland. Not truly exciting or captivating TV.